Since the National Football League became mired in cases of domestic violence perpetrated by players, to help regain positive press the league announced a partnership with a domestic violence support hotline. But since the announcement nearly a month ago, the NFL still hasn’t given a penny to the hotline. TMZ Sports looked into the announced partnership between the NFL and the National Domestic Violence Hotline and discovered the lack of funding. 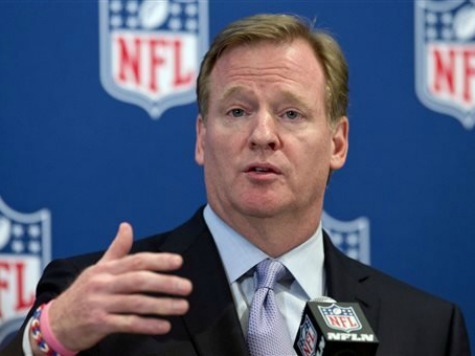 On September 19, NFL Commissioner Roger Goodell made the announcement that the league had entered into “long-term partnerships to provide financial, operational and promotional support” for the National Sexual Violence Resource Center and the National Domestic Violence Hotline. But now, 25 days later, not a penny has been transferred from the NFL to the anti-violence organization. The CEO of the anti-violence group, Katie Ray-Jones, says that things are still moving forward in “good faith.” But it was also noted that the organization already hired 20 new employees expecting the money from the NFL to float their salaries. Clearly if the money doesn’t start rolling in soon, these people will lose their new jobs. The NFL has been mired in a wave of bad publicity with several players ending up being accused of beating up their wives or girlfriends. The most notorious case was that of Ravens player Ray Rice, who was eventually cut from the team and banned indefinitely from the NFL after video showed him hitting and knocking his then girlfriend unconscious in a New Jersey casino. But Rice isn’t the only player facing charges of violence. San Francisco 49ers player Ray McDonald also faces such charges. Others who face or have faces such charges include Greg Hardy (Panthers), A.J. Jefferson (Vikings), and Dez Bryant (Cowboys). Still, by some estimates, the problem with violence in the NFL is actually lower than that in the general population. Despite that finding, the NFL has been fighting this bad publicity for a month, publicity that its partnership with the anti-violence hotline was supposed to mitigate. The lag in fulfilling its promised donations are not helping the situation.